A collision between a private bus and a passenger van has killed 10 people. The incident had occurred today (17th) around 1.30 am in front of the National School of Mahiyangana. 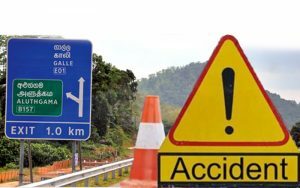 A private bus heading towards Diyatalawa from Trincomalee collided head-on with a van that was travelling in the opposite direction to Mahiyangana. It is also reported that 12 passengers including three children and three women were travelling inside the van at the time of the accident and 10 were killed on the spot. Two passengers have been admitted to the Government Hospital in Mahiyangana. The Bus driver who is said to have driven the vehicle in a reckless manner has been arrested by the Mahiyangana Police. Further investigations are being conducted.